This movie satisfies my inner inclination towards being recluse at times. Road to Vairagya, or ultimately to salvation, was really a bumpy ride for the protagnist Raju, a freelance guide by profession. 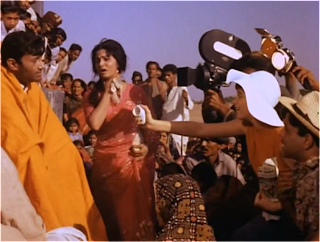 The film as we all know was based on RK Narayan's novel by the same name. So it has the well-structured storyline contrary to some of the movie of that time, or even nowadays cinema. 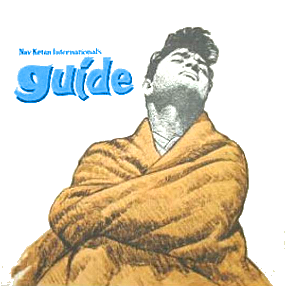 Guide is inimitable, just like any other classic, as these gems were created keeping no filmy-formulas in mind. So the outcome of such movies may or may not be profitable but they will always be honored with highest tributes, whenever showcased.The movie songs play an integral part in the movie storyline & screenplay, as they're not as obstacles, but they carry forward the story beautifully. 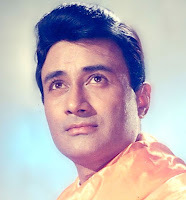 Music was carved nicely by legendary SD Burman, and Shailendra lyrics were fabulous. The story revolves around this popular, culturally well-versed charming guide, who was good in what he does. Apart from being a guide he had his small shop on railway stations where he'd placed a minor to handle the shop. He had one good friend, Gaffoor, who use to help him with the transportation for the visitors for sight-seeing in his jeep. Once an archaeologist Marco comes to the town for some cave research with his beautiful wife Rosie. He was an aged wealthy man who has married Rosie, a daughter of courtesan. He hired Raju for exploring caves, and eventually had one discovery within caves. But as always, he continued neglecting Rosie and treated her so badly at times that she decided to kill herself, and rescued many times by Raju. She had a passion for dancing, for which she often stole some time with Raju to exercise this hobby during the visit. Raju had a deep sympathy for Rosie, and he applauded her talent many a times to motivate her to choose life over suicidal behavior. In the process he fallen in love with her and shown her a dream of freedom from agonies & pain, to follow her penchant for dancing where her true potential lies. After rescuing her from Marco, he took her to his home. And he was criticized by one & all for his move. He had to confront with each and everyone for his illicit relationship with a married woman. He had to break all the relationship to keep his love-life with Rosie alive. Away from his home, he made her a dancing sensation countrywide by building influential nexus in the high societies. But later on Raju started living lavish lifestyle on the money of Rosie. He used to convince her for signing cheques for even gambling, much to the dismay of Rosie. In the meanwhile, Marco published his book on the caves, and gifted one copy to Rosie, which Raju hid deliberately to avoid any spark in Rosie's heart for Marco and he didn't wanted to lose her to Marco's ambitions of wooing her. But Marco kept on trying to meet Rosie, always blocked by Raju. He legally granted all the jewels in his account to Rosie for which she had to sign on some papers. But Raju, in his move to avoid Rosie getting flattered by such attraction from Marco, used fake signatures of Rosie to get rid of the issue. Inspite of all these, the distance between the two started building leaps & bounds, picturized beautifully in the song Din Dhal Jaaye. Rosie had somehow built a firm wall between Raju & her. He was shocked & at the same time depressed by her rude behavior towards him, and decided to leave her house & theatre to go back home. And then in his absence his fake signature issue came back rocking upon him when he was at home. His own friend, a policeman came to arrest him in his village. He requested him to see Rosie once before going to jail as he was astonished by the fact that complaint was lodged by her. When he did visit her in the theatre, he was taunted well by Rosie through a beautiful song Saiyaan be-imaan. Raju was unable to explain his intent behind his act, that he was doing all this for her only. He was again down into sorrow. He was sentenced 2 yrs imprisonment. He was released early due to his good conduct, but he chose to forbid his family, love & city for totally unknown place. 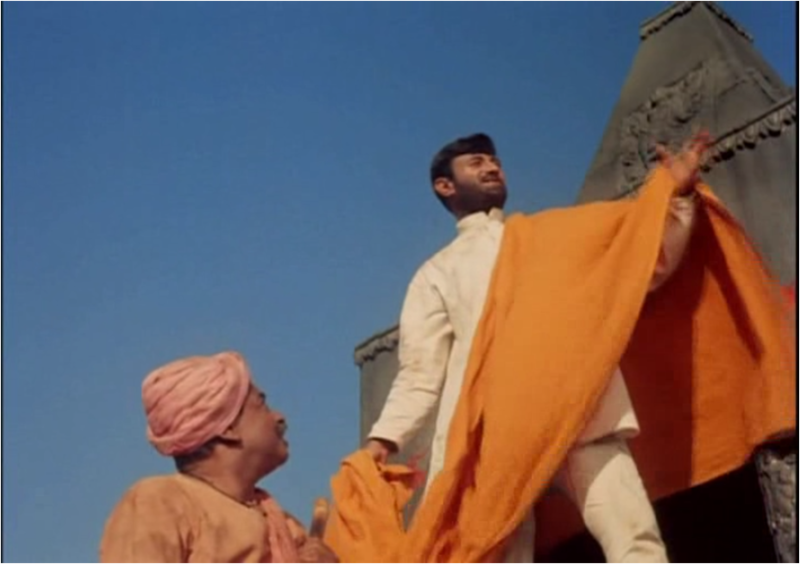 This happens just in the beginning of the movie, with a masterpiece song, Yahaan kaun hai tera musafir. And all the story continues in the flashback. This movie has one of the perfect beginning. Even after knowing the fate of Raju in the very start, we tend to enjoy and stay curious for the upcoming incidents due to nicely weaved treatment by Vijay Anand, the Director of the movie. My high regards to him, he was good as director. Even though he was not willing to direct Guide initially, he presented the best out of him. Raju travelled a lot forgetting every attachment, every near & dear one. He reached one remote village where he was misunderstood as saint by villagers,especially Bhola. Even he liked the idea, as his words of wisdom were accepted whole heartedly by one & all. He use to tell them stories of wisdom. He told them once how one saint kept fast for 12 days for rain. Once a famine hit the village, and due to some misinterpretation by an idiot in the village he was emotionally blackmailed to do the same. He just wanted to stop villagers from fighting each other for hunger, but now his own life was in danger, So he tried to convince them that he is no different from them and is just as sinful & ordinary as them. But villagers were not ready to lose faith on him. And he tried to ran away from the village but returned. Initially, he felt tortured by the fast and felt deep longings for food, but gradually his belief on the fast & the devotion behind the same grew dramatically. He now wanted to continue fast to answer his own spirtual queries with ultimate Godhood. He became popular worldwide, and people from far across the world started flocking on village to have glimpse of Swami Raju. Eventually all his forbidden loved ones cam running to meet him. His mother, friends & Rosie all found him in this new surprising tragic phase of life. Often questioned by his self about the vitality of fast after his reunion & acceptance by loved ones, Raju didn't got distracted and stayed firm on his fast. 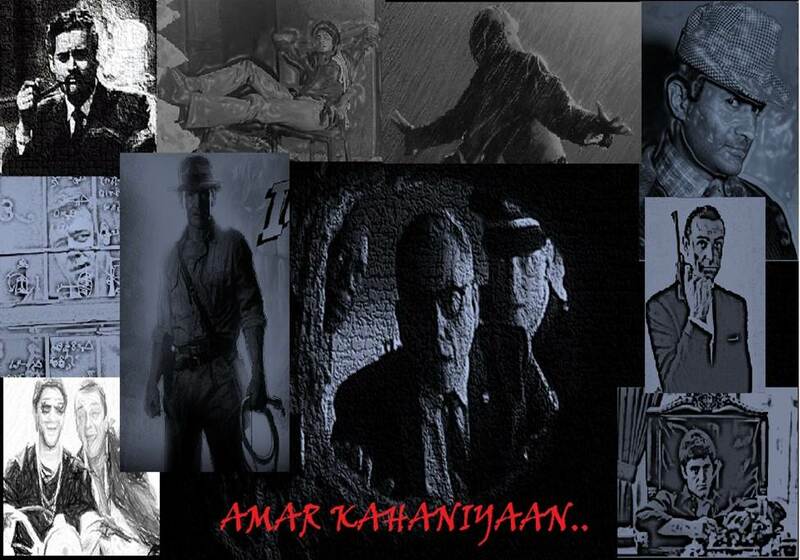 And finally he found salvation after going through the crossroads of pain in form of Aatma-rahasya. He reached self-actualization stage wherein he could ruled out the mortal body for the attainment of the absolute immortal AATMA. He felt the presence of the Almighty within his reach and also felt drained by the showers even before they arrived. People were thrilled to have rains after months, but Raju was mo more in his body to share this happiness of villagers & loved ones. But the superb lines of wisdom echoed once again, seems to be captured from Geeta, Na Sukh hai Na Dukh hai, Na Din Na raat, Na Deen Na Duniya, Na Insaan Na Bhagwaan, Bas mai hun, Mai hun, Mai hun !!! 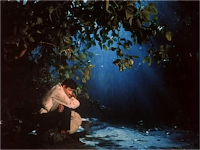 SD Burman Gem of a song: Waha Kaun hai Tera ! I stumbled on your blog via Sharmi's, and was very interested that you have apparently decided to focus on classics! I am myself a lover a classics too. As for "Guide", well I'm sure you know that the movie was inspired by Narayan's novel (http://www.letstalkaboutbollywood.com/article-17382307.html), and if you haven't read it, I strongly urge you to; it's rather different from the movie, and for me is vastly superior... Let me know what you've thought! Nice to hear from you ! I totally agree with you that Movie was different from the Novel. 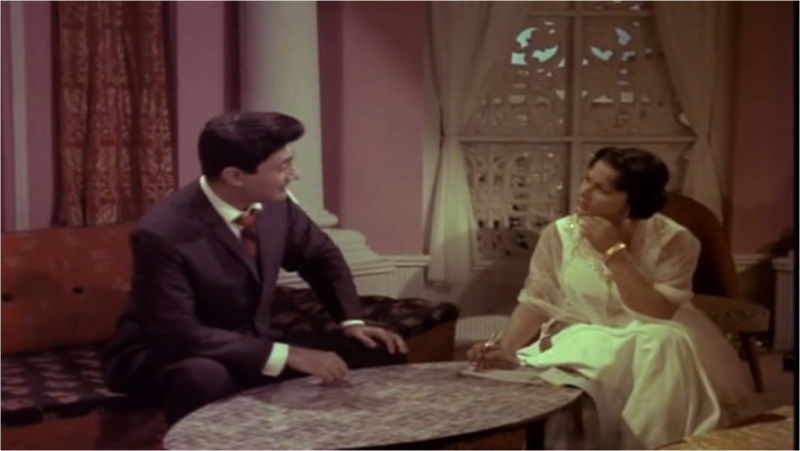 And we know how desperate Dev Anand was to make movie on the novel that he left blank cheque on Narayan's office. And interestingly Mr Narayan was never happy with the movie version and said to criticize the way Raju was portrayed in movie. But all these facts apart, if you watch the movie with fresh perspective, you can visualize an innovative screenplay & well conceived story well ahead its time. Thanks for sharing your thoughts ! By the way a nice link, and one thing is for sure. Movie can never compete with the book. As in book you get the detail canvas of the story. I would recommend you to read CHANAKYA'S CHANT, a new historical-thriller genre fiction novel by Shawn Haigins(Ashwin Sanghvi). It's movie rights has been bought by UTV Motion Pictures, but I seriously doubt the story execution could be as spectacular as the book.